By Aviva Imhof, Susanne Wong and Peter Bosshard. Published by International Rivers Network. 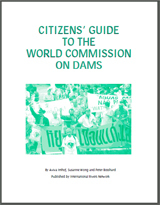 This Citizens’ Guide to the World Commission on Dams is intended as a tool for people in their struggles for social justice and environmental protection.